What do you wear under your clothing? These informational, silly, goofy, laugh-out-loud, picture books will have everyone giggling! 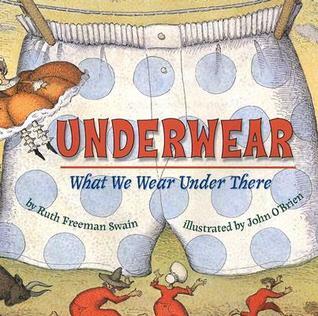 Funny, flip-up book for preschoolers with animals from A to Z all in silly underwear! An earlier underwear book by Todd Parr, this one pokes fun at the silly things you should and should not do with underwear. For example: Do wear underwear when you go Trick-or-Treating-Don’t wear it over your costume. Do wear frilly underwear under your fancy dress-Don’t hang upside-down on the monkey bars. Do wear new underwear on the first day of school-Don’t bring it for Show-and-Tell. Great fun reading the history of underwear from ancient times when people wore loincloths to the Middle Ages and from the 15th Century to the 21st Century. Young readers will enjoy looking at the people throughout the ages in their underwear and wonder how or why in the world anyone would want to wear some of these pieces of clothing. Detailed explanations for each garment support each illustration. The front cover has a real-feel pair of underwear for toddlers and preschoolers to touch. It’s a simple, funny story about a little bear who is playing hide-and-seek with his forest friends. Bear waited and waited for someone to find him and finally gave up to go home. Along the way he trips over a backpack, which he decides to take home with him. Once home, all his friends are waiting for him and encourage him to open the backpack. Wow! It was filled with underwear of every pattern and color. Bear tried on every pair until he found one that fit just right. The other animals were so excited that they each wanted a pair of underwear also. And like they said, it was totally rad, sweet, awesome, and super cool! Another funny flip-up animal book. 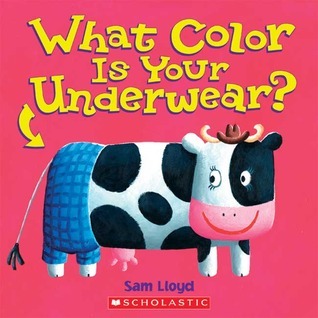 Each page asks an animal what color their underwear is. To find out the answer, the reader has to flip up the flap of clothing and peek to see what underwear that animal is wearing. Lots of fun for preschoolers!